Texture can make or break your baked goods, and for me, great texture is about balance. You don’t want a cookie that is too soft or too crisp, and striking that balance takes patience, attention to detail, and a bit of intuition. I always (seriously, always) under-bake peanut butter cookies by a minute or two, pulling them from the oven when they still look puffy in the middle. Once you remove cookies from the oven, they keep baking for a few minutes while they cool on the baking sheets. So if you under-bake them by just a minute or two, they’ll reach the perfect level of done-ness while they’re cooling on your baking sheets, and they won’t end up too crispy. 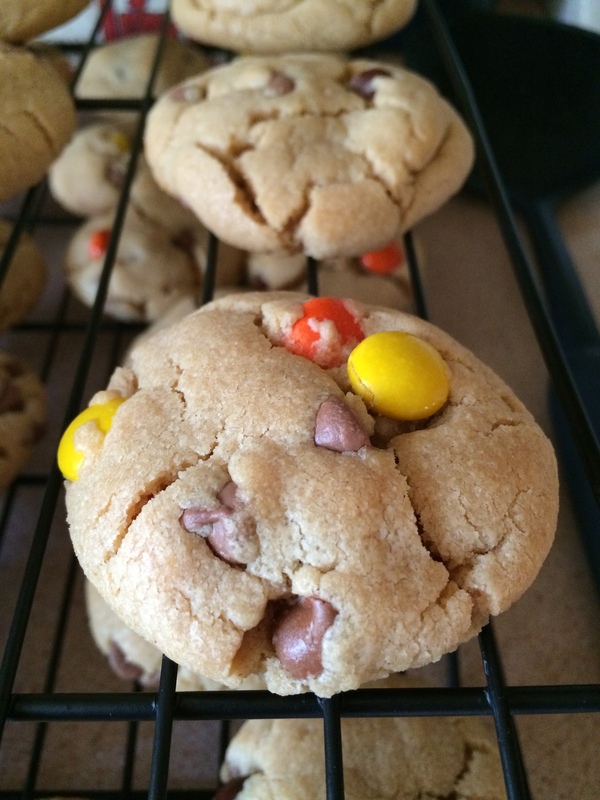 These cookies have a great texture, being both soft and chewy and studded with crunchy Reese’s Pieces. I found this original recipe on Six Sisters’ Stuff, where they are billed as triple peanut butter cookies and use peanut butter chips instead of chocolate. I thought that might be a bit too peanut buttery, so I opted for chocolate chips with great results. Preheat oven to 350 degrees. Line several baking sheets with parchment paper. Note: this makes a very, very large batch of cookies; mine made almost 5 dozen. In a mixing bowl, cream together butter, peanut butter, brown sugar, and white sugar until well-combined and fluffy, scraping the sides of your bowl often. Add eggs and vanilla, beating well to combine. Add baking soda, then 1 cup of flour, beating to combine. Add remaining flour 1 cup at a time, mixing between each addition, to form a soft dough that pulls away from the sides of your mixer. Add Reese’s Pieces and chocolate chips; I used my hands to mix them into the dough. Roll dough into 1 1/2 inch balls and place about 1 1/2 inches apart on prepared baking sheets; they do not spread that much when baking, but you don’t want them too close together. Bake for 10 minutes, until cookies are still puffy in the middle but brown on the bottom (just use your spatula to gently lift one cookie up to check the bottom). Remove from oven and cool on baking sheets for about 3 minutes, then remove to a wire rack to cool completely. Once again, I’m eating them all.